I had a different picture planned for today but recently received this in an email from my sister. 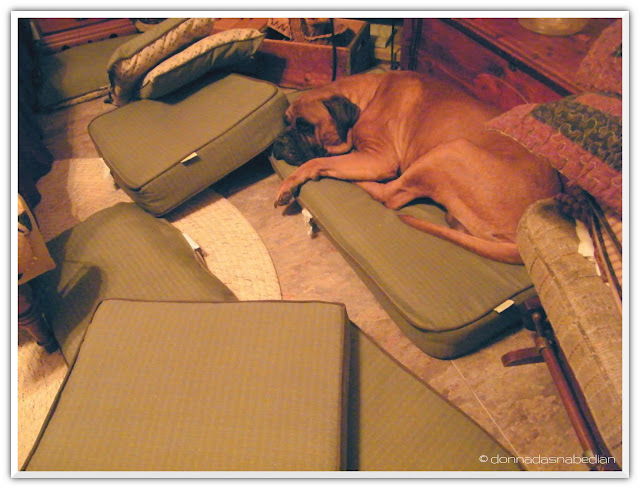 Apparently her Bull Mastiff*, Thor, didn't appreciate how she had the cushions laid out and decided to, shall we say, 're-decorate' according to his needs. * Donna, did I finally get it right - Bull Mastiff, not English, yes? Clearly Thor knows doggy feng shui -- notice how the left hand one is perfectly placed for his head. Leslie -- he's a big boy! Perfect name! Now that is really redecorating. Good thing he didn't decide to move the whole couch! You're right, Les, not an English Mastiff- a Bullmastiff. Those are our outdoor furniture cushions- we brought them in when we were expecting the hurricane to come closer. Glad he enjoyed them. It's just as well Donna took the photo, next time she can arrange them just like this and save Thor from having to do it:) He's a gorgeous chap. LOL! Looks like Thor has it right!!! Love it! Maybe him and Twiggy discussed this beforehand?? It looks to me as though Thor definitely got it right!! What do humans know about arranging cushions!! Huh? Thor is a great name for a Mastiff!!! Barbie does that with cushions sometimes but she much prefers blankies as she can pull them off the couch or bed and make them into a perfect greyhound nest. And Thor didn't even need to jump all the way up on the couch. What a smart boy. Nice decorating job! I am sure there are a lot of canine clients around who would like to hire! Well I think Thor did a lovely job. LOL! LOL - not a bad idea that. He is a handsome fella, isn't he? LOL - he could certainly be of assistance to some of the more diminutive canines in our company, don't you think? What a great photo moment!